Your business depends on effective inventory management. It’s how you fill orders, move your products from place to place and make sure your customers are happy with the results. If you have trouble managing your inventory or keeping track of your products as they move through the supply chain, some of your items could get lost, stolen or damaged along the way. You won’t be able to fill orders as quickly, which can put you at a disadvantage in the marketplace, especially when it comes to competing with massive corporations like Amazon. 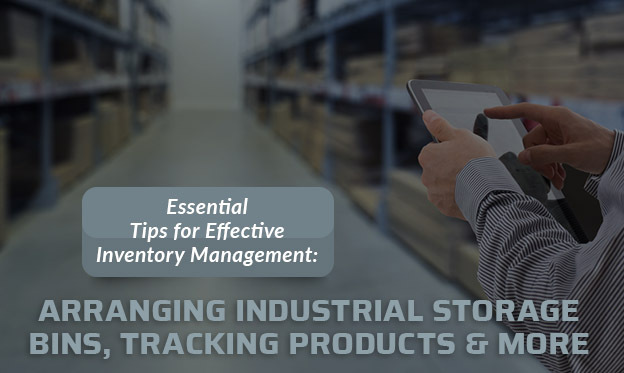 Learn how you can improve your approach to inventory management, including the latest trends, common challenges and how to solve them. Holding onto too much inventory can cost your business a fortune in warehousing and storage. If your products are slow to move off the shelf or your inventory levels are higher than your average sales, your business could end up losing money with every order. If you’re constantly turning away customers because you don’t have enough products on the shelf, you need to improve your inventory process. Analyzing previous sales data and tracking individual product demand can help you better optimize your inventory, so you can always meet the needs of your customers. You should always have an understanding of how your customers perceive your company and its products. If your customers complain about damaged items, delayed orders or not getting the products they paid for, your inventory management could use an adjustment. In today’s competitive retail environment, companies need to do everything they can to keep their customers coming back for more. Nothing can be more frustrating than losing track of your inventory, especially if you’re tracking and delivering high-end products that are worth hundreds or thousands of dollars apiece. Over time, your company will lose money and you may have to resend items if they get lost in the shuffle, which means delaying orders and disappointing your customers. Warehousing and inventory management costs can easily spiral out of control if your company is holding onto too much inventory. If these costs start eating away at your bottom line, you need to adjust your approach to lower your inventory costs, so your business can turn a profit. 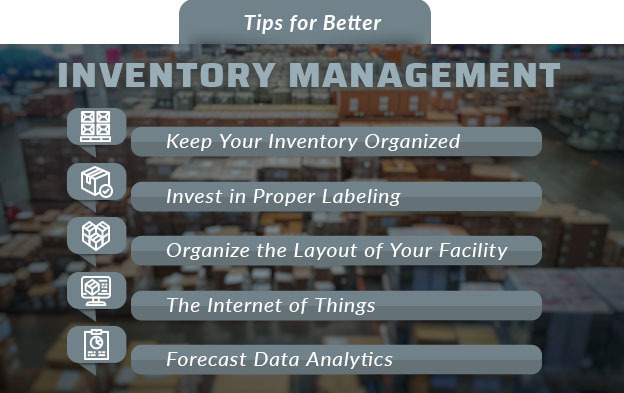 Improving inventory management often comes down to forecasting. Knowing how many products to order can be difficult if your business isn’t sure how many consumers will eventually order these products. A recent global retail supply chain survey shows retailers are investing in forecasting more than any other type of management technique. Data analytics can help you better track and monitor demand trends in your industry, so you’re not caught off guard when more orders start coming through the door or demand for one of your company’s products suddenly plummets, leaving you with either too much inventory or not enough. Once you have an idea of how many products you need to keep on hand at all times, you can start focusing on better organizing your inventory. You should know where to find certain items in your warehouse at any given time, so you and your team can fulfill orders as quickly as possible. Your inventory should be organized in a way that makes sense to you and your employees, whether it’s by color, product category or demand. Keeping in-demand products close to the loading dock can speed up the order fulfillment process, so you don’t have to go to the back of the facility every time a new order comes through the door. Keeping track of your products is one thing but making sure they arrive on time can be just as challenging. Whether your company is delivering these products or passing them off to a third party, you need to make sure these items aren’t getting lost along the way. If a delivery is delayed, you should be the first to hear about it so you can coordinate with your customers and respond to their concerns in real-time. Using real-time trackers and reliable delivery partners can help assuage these concerns. Keeping your products close to the consumers that use them can also shorten the delivery timeline, reducing the chances for errors and unexpected delays. 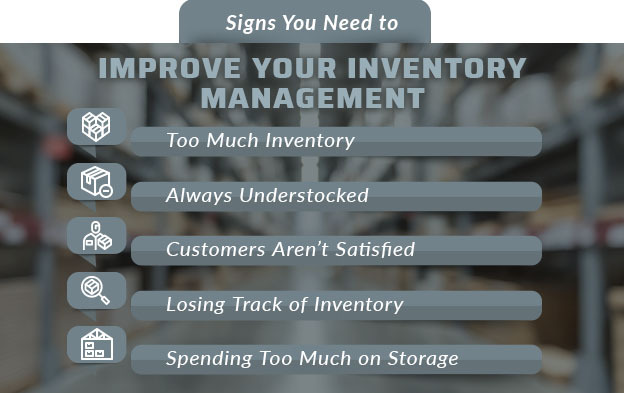 Now that we’ve addressed some key areas for concern, let’s talk about all the ways you can improve your approach to inventory management. Nothing will slow down your operations like poor product retravel. As we just mentioned, you need to keep your warehouse organized if you want to fill orders quickly and get them out the door as soon as possible. If you’re having trouble organizing your products, try investing in industrial storage bins and other large containers so you can separate your products by use, type, size or demand. Make sure you’re properly labeling your storage containers, so your employees can quickly find the items they’re looking for. You can also use stackable wire baskets to get more items off the floor. This helps you make the most of your warehouse space, instead of placing bulky containers next to each other. Stack racks and other stackable storage solutions can help you reduce the amount of storage space you need to manage your inventory. Regardless of what kind of storage solutions you use, find bulk storage containers that suit the products they’re designed to store. If you manage smaller items, keep them in shallow drawers so you don’t have to go digging through a large container to find the product you need. If many of your products look alike, make sure your employees can quickly identify the product, so they don’t accidentally take the wrong one by mistake. Every container and aisle in your storage facility should be labeled according to the products they store. 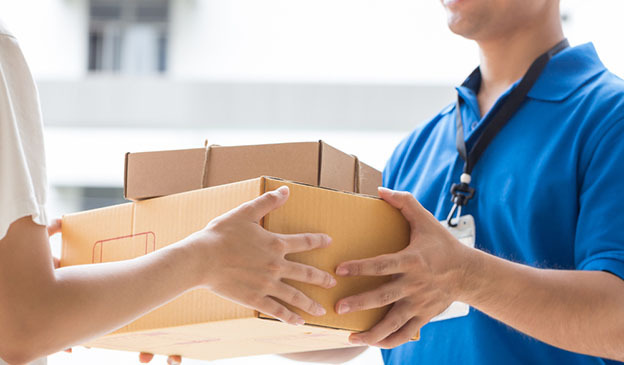 Some of your employees may mistakenly put an item in the wrong storage container, which leads to order inaccuracy and delayed order fulfillment. If one of your storage bins is empty, properly labeling the container will help you and your team avoid these kinds of mistakes. Walk around the facility and look for ways to improve your signage. Someone who’s never been to your facility before should be able to look up and follow the signs until they find the product they’re looking for. Rearranging your storage facility can help you avoid certain costly inventory management mistakes. Larger items and those that tend to be the most in-demand should be kept close to the ground near the front of your facility. This ensures your employees can retrieve items quickly. Stacking heavy items on top of lighter items can also damage the products underneath. Your employees should also have plenty of room to move throughout the facility. If your aisles are too narrow or the corners are too tight, your employees and any equipment they may be using could easily damage some of your products. Dollies and lift trucks should be able to get in and out of aisles quickly and easily. 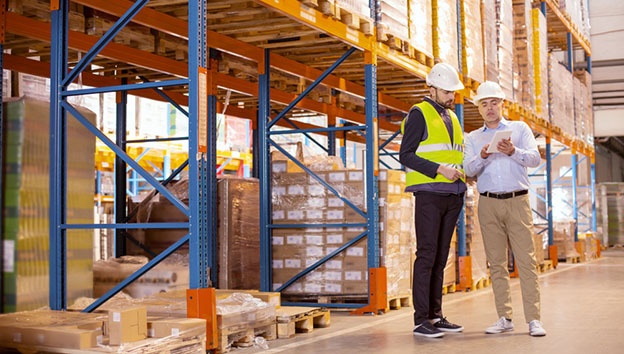 Businesses are also investing in the Internet of Things (IoT), or devices connected to the internet, to keep up with inventory management. Smart scales, thermometers and other wireless devices automatically store and share valuable product information, so you and your team can effortlessly keep track of how many items you have in the facility, their condition and how long they’ve been sitting on the shelf. These devices also help you avoid costly data entry errors. Instead of having your employees enter product weight into a spreadsheet, the device will upload this information automatically, so you can rest assured this data is always accurate. Attaching real-time trackers to your products can help you keep track of your inventory. If something isn’t on the shelf where it should be, you can always track the product online, so you can quickly find it in your warehouse. Forty-six percent of small-to-medium businesses either don’t track inventory or use a manual method. Even if your facility is smaller than most, items can still go missing. Tracking your inventory ensures you can locate products quickly. Knowing when to order more products is a fundamental part of inventory management. But instead of waiting until the last product leaves the shelf, automatic sensors will alert you when you’re running low on a particular item. As soon as you see a notification, you can order more inventory based on the latest demand forecasts. It all starts with proper demand forecasting. If you haven’t already, your business needs to invest in quality data analytics so you’re not flying blind when it comes to inventory management. With the right software, your business should be able to automatically track how many orders are coming in versus how many products are still on the shelf. Demand can easily shift on a dime, especially if your business is seasonal, so make sure you always have an idea of how many people want to buy your products. New software programs will even analyze the data on your behalf using a customized interface. As soon as you open the program, you can see how demand has changed or is expected to change in the months ahead, so you can update your inventory accordingly. You can also use data analytics to gather more information on your operations. Even if everything seems to be running smoothly, there’s always room for improvement. As we mentioned earlier, competition is fierce in the retail industry, so if you want to get ahead, be prepared to make continuous improvements to your operations. Automatic sensors will give you information about how quickly your products are moving through the supply chain, from the shelf to the loading dock and all the way to the consumer. Analyze this data over time to pinpoint weaknesses in your operations and resolve them accordingly. As companies like Walmart and Amazon continue to dominate the retail market, companies large and small are doing everything they can to improve the delivery process. This usually means keeping products closer to the end-user and reducing warehousing costs as much as possible. 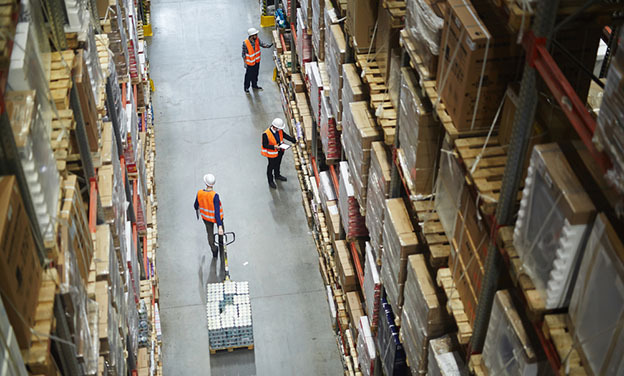 Some companies are sharing warehousing space in densely-populated areas or hiring third parties to hold their inventory for them, so they can reduce the delivery timeline. Customers also want more transparency when it comes to tracking and receiving their orders. Today, most consumers expect to be able to track their orders in real-time, so they can anticipate arrival times. Inventory carriers are using real-time GPS trackers to create more visibility in the supply chain, so retailers and consumers can track products as they move from one location to another. Warehousing is one of the most expensive aspects of any retail operation and making proper use of your facility will help you reduce these costs and improve your operations. From proper labeling to finding the right storage containers, it’s all about organizing the space in a way that makes sense to you and your employees. You should constantly monitor your operations, so you can make improvements along the way. Demand is always changing, so use data analytics to stay on top of these trends before they start to impact your bottom line. 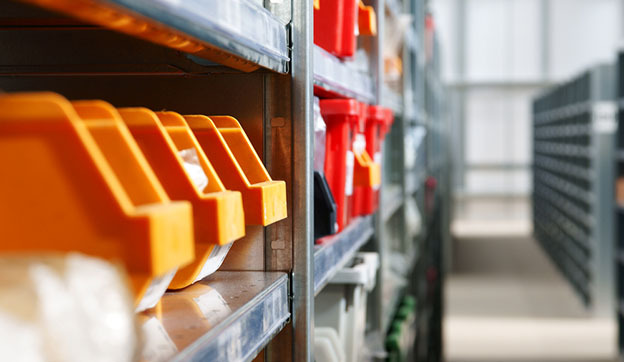 Improve your inventory management with new technology and logical storage solutions. This entry was posted in Industrial Racks, Storage on April 9, 2019 by dmadden.